In the second inning, Elijah Henderson grounded a two-out, two-run single for his first career hit, then Byrd smacked a solo homer, his third of the season, in the third inning. The Tigers scored three runs, including two on run-scoring singles by Byrd and Bryar Hawkins, in the fifth inning to up their lead to 6-1. 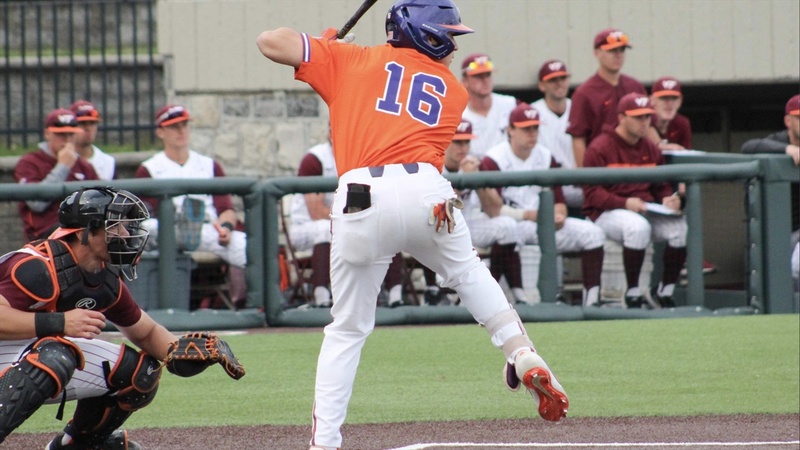 The Hokies scored a run in the sixth inning on a wild pitch, then added two runs on Kerry Carpenter’s two-out, two-run triple in the seventh inning to narrow Clemson’s lead to 6-4. Logan Davidson extended his hitting streak to 14 games with a double in the ninth inning. Sharpe (4-1) allowed four hits, two runs (one earned) and two walks with six strikeouts to earn the win. Carson Spiers pitched the final 2.1 innings to record his eighth save of the year. Hokie starter Ian Seymour (4-1) suffered the loss, as he yielded eight hits, six runs (three earned) and one walk with three strikeouts in 6.0 innings pitched.